For more than two decades, resident Carmine Percontino has displayed a holiday scene outside his home at 827 Willow Ave.
Over the years, he has created three more placed around uptown Hoboken during December. Two are outside 827 Willow Ave., one is outside 1032 Park Ave., and the newest addition is outside the Hoboken Historical Museum at 12th and Hudson streets. The nativity scenes are also called presepios or crèches. 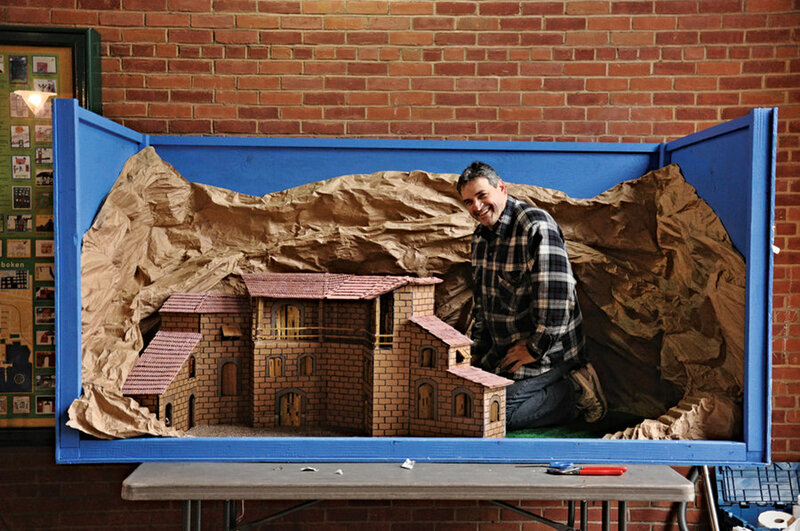 Percontino uses cardboard, brown paper bags, wood, figurines, tree branches, and rugs that look like grass or sand to create them. The presepios take about two weeks to make from scratch, according to Percontino, who has worked seven or 10 hour days to complete them. However, Percontino said he no longer starts from scratch each year. Now Percontino stores them and brings them out for about six to seven weeks from December to about Jan. 7. The largest one outside his home is now on wheels as it weighs about 120 pounds. Percontino said he almost lost the biggest display during Hurricane Sandy in 2012. Percontino, who has lived in Hoboken since his family immigrated here in 1965 when he was 10 months old, grew up with a rich family history and tradition of creating presepios. Over the years, the “dioramas” began taking up to much space. The detailed displays, now encased in water proof plastic to protect them from the elements, depict what Percontino calls “Christmas villages” with inspiration drawn from his hometown of Monte San Giacomo Italy. “The one outside the museum has cardboard houses with roofs that look like they are made from terracotta, like in Italy,” said Percontino. Percontino said no one has ever vandalized or tried to damage the displays. Percontino said the residents love it, especially the kids. Percontino has used the displays to ask for donations for the homeless such as canned goods. He once had a podium requesting the donations, but it got destroyed in the flood. He said he hopes to make a new one for next year so he can go back to donating. He said he also hopes to make more presepios for family and neighbors in Hoboken in the years to come, as he thinks he will be able to commit more time to it. This year the Hoboken Historical Museum sent out about 1,000 chapbooks about Percontino’s story to its members, which recount his time growing up in Hoboken and his passion for presepios. The chapbook is part of the museum’s “Vanishing Hoboken” series of the Hoboken Oral History Project overseen by Director Robert Foster and Editor Holly Metz.